Our final day in the country and looking at the itinerary, there was little promising planned for wildlife. After breakfast a small flock of Turnstone landed on a puddle below the hotel car park. We stopped first at some hot springs in a nearby town and ate boiled eggs for brunch cooked by heat from the Earth's core - that's a first. Then we headed back to the west coast on the bus. Driving through the town of Selfoss, I noticed a small flock of Long-tailed Duck on the river, which were the only ones seen all trip. Also, nearby, on a small roadside pool, I spotted a brief but distinctive Red-necked Phalarope bobbing on the surface. 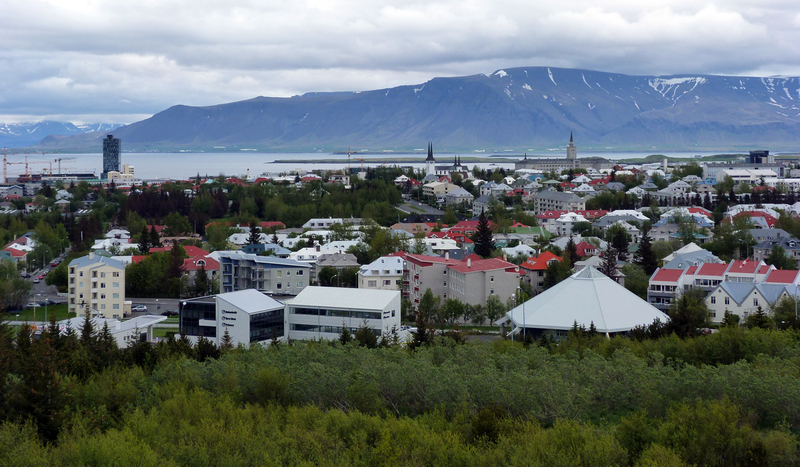 We eventually arrived in Reykjavik where the first stop was at a viewpoint over the city. 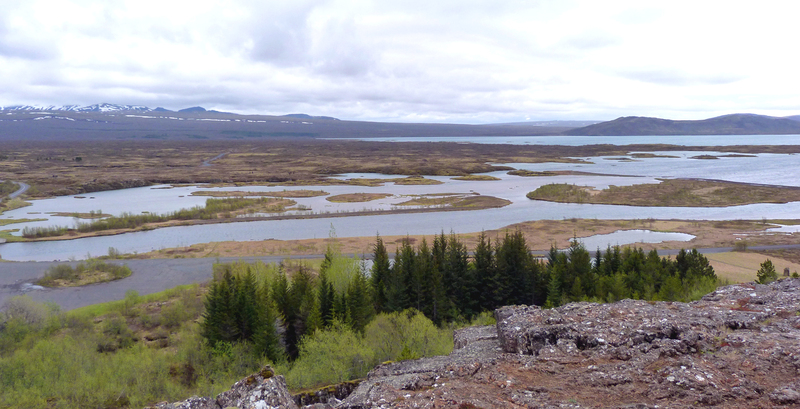 This was surrounded by birch trees and there were plenty of Icelandic Redpolls flying around, some giving decent views as we were at treetop height. Again my attempts at seeing them properly were scuppered as we were hurriedly ushered back onto the bus. 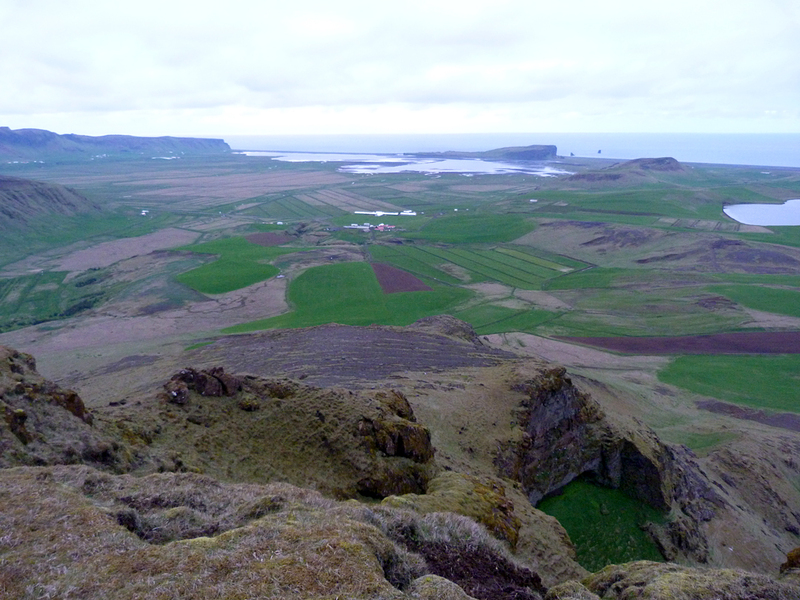 Later in the morning we headed to the far SW of the country to the Reykjanes Peninsula, which is the location of the airport. 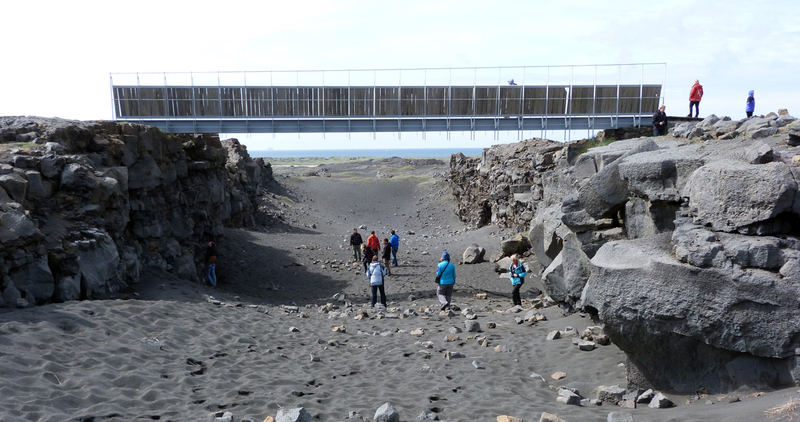 We stopped at "Leif the Lucky Bridge" which spans a split in the rocks caused by the spreading of the Earth's crust. 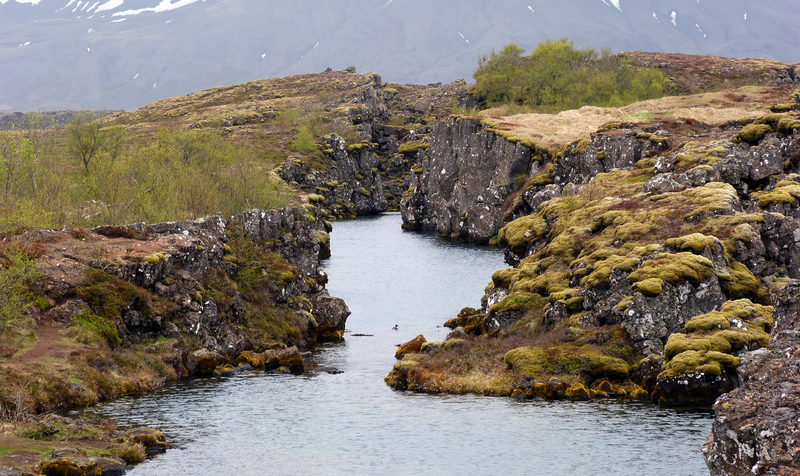 To the left is the Eurasian plate, the right is the North American plate, and the gap gets wider. It's probably not exactly so, but it is more symbolic I guess. Named after Leif Eriksson who did indeed cross to America of course. After this, we visited the nearby hot springs and mud pools. The colours here were fantastic, with the different salts and sulphurs producing red, yellow and orange soils, and lakes of turquoise and green, and smells of a fine distinction. There were lots of Arctic Terns here. I wasn't sure if they were breeding but it did look like a colony in amongst the steam. I thought that was it, and was expecting to go straight for our afternoon flight to the airport. But we were lucky and had a little time to spare and so we spent a while at the headland at the most south-western point of Iceland. There were lots of birds in this area. As well as the ubiquitous Arctic Terns, there were lots of Kittiwakes here due to the colonies present on the sea cliffs and the offshore stacks. This was a famous spot because on the seabird island visible out to sea, the last Great Auk in the world was killed and so the species became extinct right here. There is a statue to commemorate this. I scanned the sea just in case a lonely individual had survived, but the only auk on view was a Black Guillemot bobbing on the waves. So back to the airport and a flight home. Only an hour's delay and that was that (apart from 2 buses, another flight and a stay in a hotel). I was disappointed about missing out on Gyrfalcon but I was more than satisfied with the superb Harlequins. As a birding trip, I wouldn't say Iceland would be my first choice due to lack of variety of species, but of course I didn't go to the most interesting areas. But as a trip of astounding sights I could not fault it. Some of the group, who clearly go on big trips regularly, seemed pretty blase, but I was constantly amazed at what I saw and rarely kept my eyes off the bus window. So extremely enjoyable and I was grateful that I got the chance to go. I look forward to returning in October. It will be very interesting to see the different selection of species in the autumn. We woke up this morning to quite sunny weather, with the snow of the glaciers shining above the valley. Straight after breakfast we headed out to Reynishverfi beach and its pretty impressive rock formations. 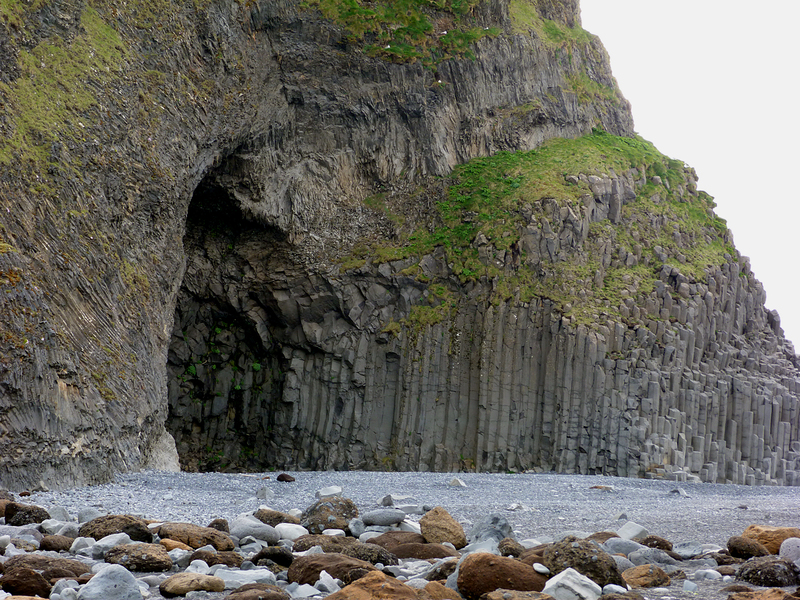 The lava had formed hexagonal Basalt columns and you could see how the rocks had been bent and twisted. 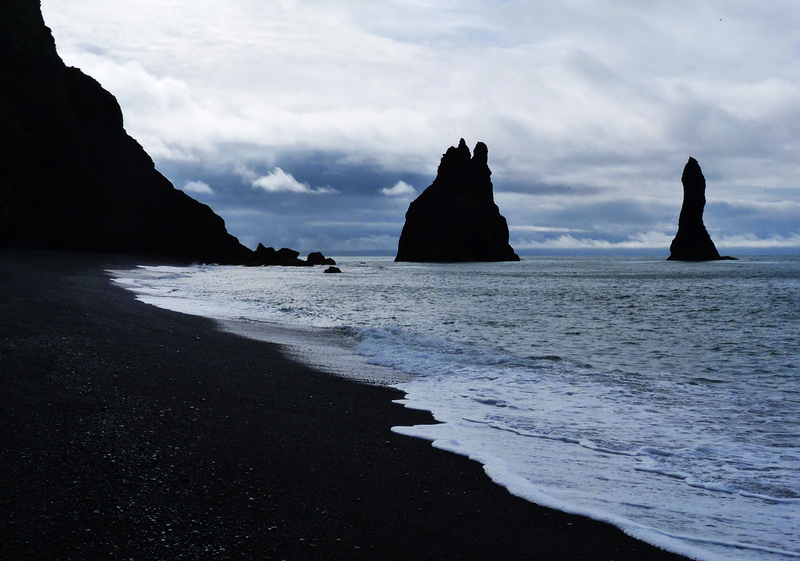 As well as this, there were a few spectacular dark stacks and arches over the sea. The sand was a dark grey colour, and blackish when wet. It was an unusual place and is apparently popular with film-makers. This was a good spot to look out to see but there was not very much variety out there. 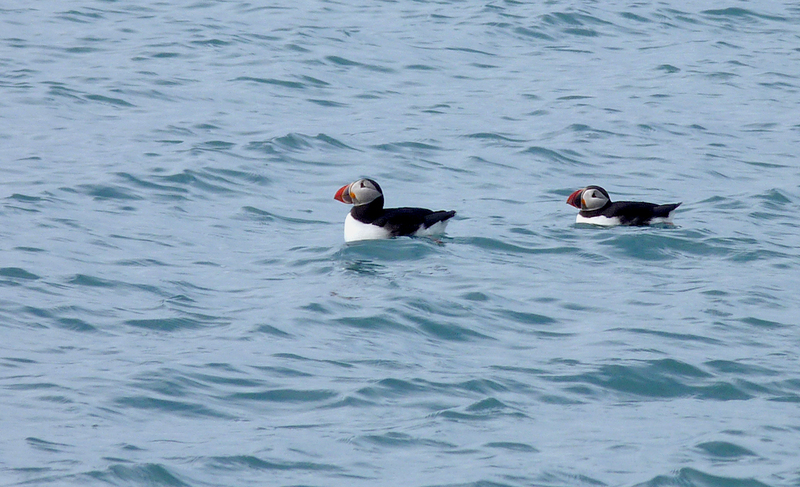 Plenty of flocks of Eider were bobbing about and there were groups of Puffin just off the beach. The Puffins were clearly nesting on the cliffs above the beach and were flying to and fro just above our heads. Again large numbers of Fulmar were nesting on all the cliffs of the area and were constantly going back and forth. 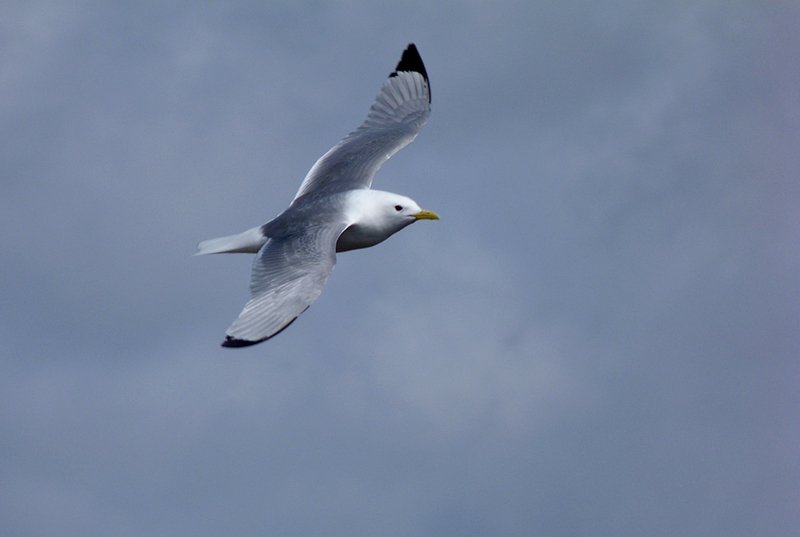 There was also a Kittiwake colony here and a single Glaucous Gull flew by offshore. Pushing on, we headed back East along the coastal road, with similar species as before noted along the roadside. Two Short-eared Owls within a mile were seen hunting the grassy areas, my only ones of the trip. 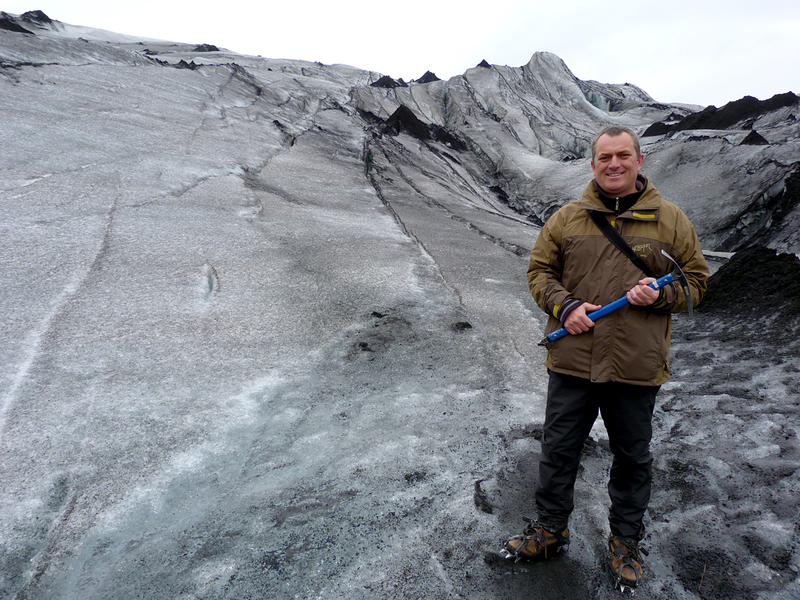 Our next stop was the Solheimajokull Glacier, where I was kitted up with crampons and an axe, for a walk across the ice. Another enjoyable escapade, the landscape on the glacier felt like another planet. 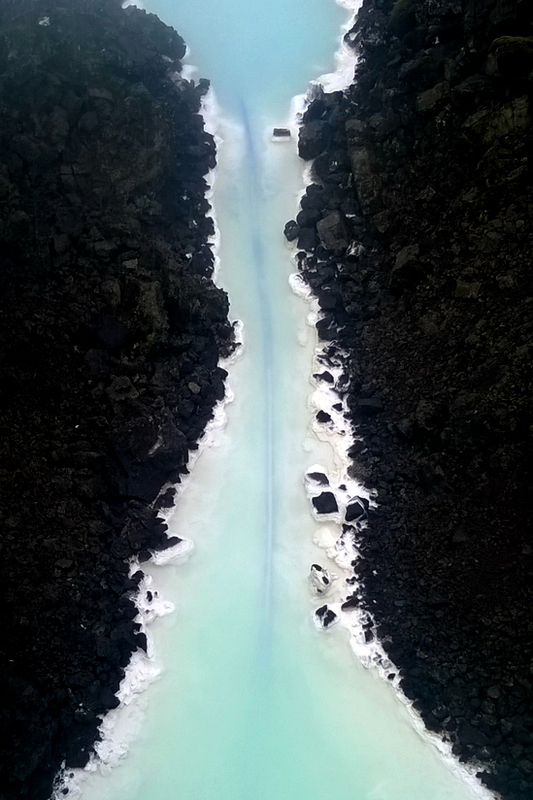 The ice wasn't sparkling white, but with layers and layers of volcanic ash, it was greyish. 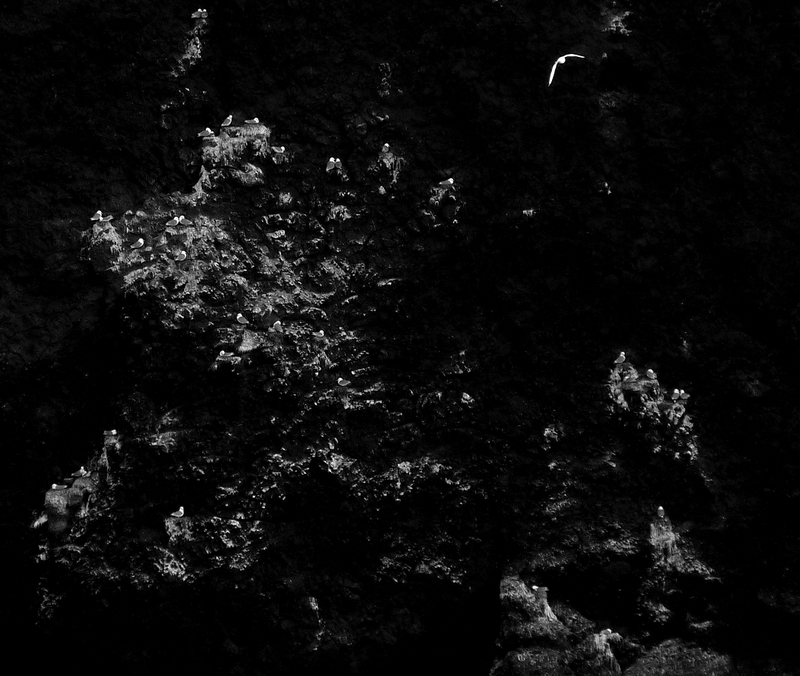 The black triangular peaks on the photos below were not rocks, but were tiny pyramids of ice. 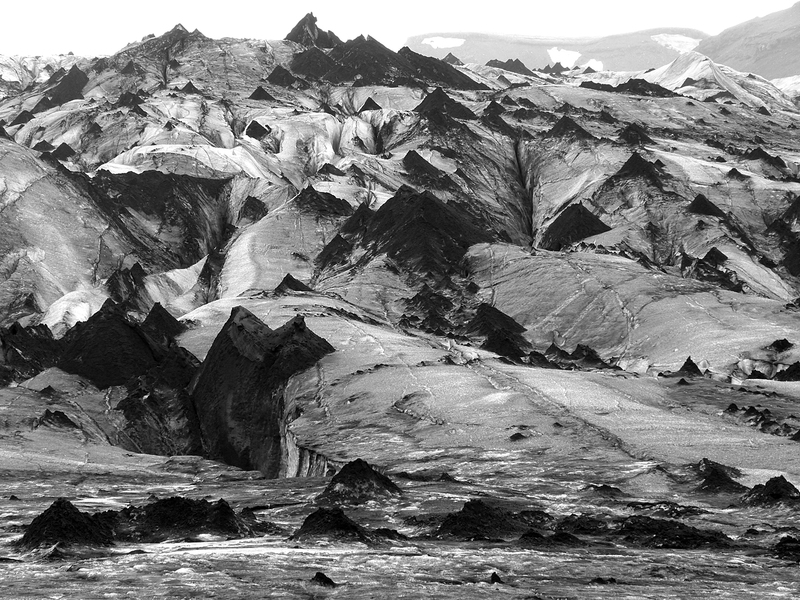 Where there were little pockets of ash inside the glacier, the ice here melts slower to make these little peaks. We were limited as to where we could go, as the cracks in the glacier went down a long way, and what looked like tiny puddles, were deep deep pits. It is a shame that this glacier is retreating at about 100m a year, which is an incredible rate if you think about it. Whilst we were putting all the stuff back in the van, a dark-phase Arctic Skua came down and landed in the car park looking for scraps. 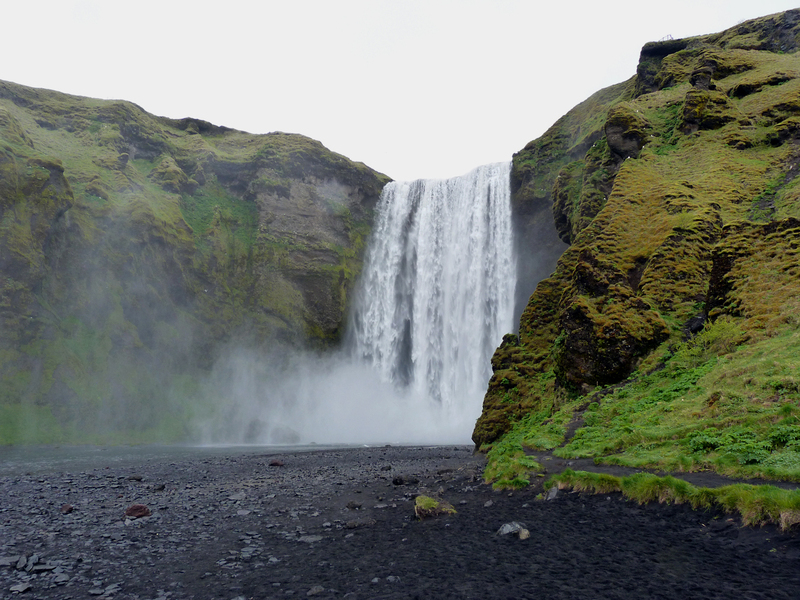 Next was the wall of water that was Skogafoss, our third spectacular waterfall of the trip. 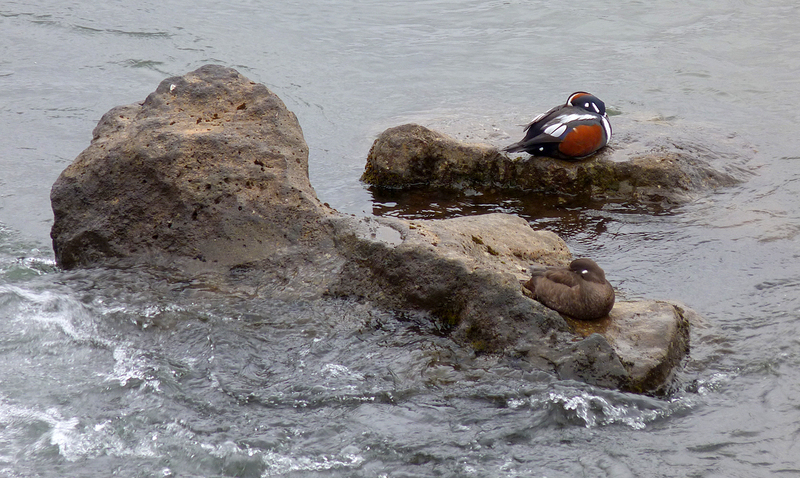 More Fulmars were nesting in amongst the spray, and I found a pair of Harlequin Ducks on the river a little downstream. This time they ween't asleep but quickly swam away when I tried to get close. In the afternoon, the coach gained ground westwards, as the weather became gloomier. I saw little and the group stopped for some pony-trekking (well they called them "Icelandic Horses", but they looked like ponies to me). I wasn't keen at all on this, especially as they seem to have rammed loads of the animals into a tiny enclosure, and they were pushing and shoving each other against the metal fences. So I declined the offer and wandered off up a road towards some trees around some cabins. Despite being one of the most tree-covered areas I'd walked in, there was so few bird species around - lots of Redwings and Meadow Pipits, with a few White Wagtails and Wheatears along the road. In the evening we arrived at Vatnsholt Farm to spend the night. It was a very nice hotel - but rather odd. The owner had a menagerie of animals 'out back' - including a rescued Arctic Fox, a Raven and some goats - and after dark he showed us a load of local TV clips of him with these animals dancing, talking, etc - very 'That's Life' stuff. There was a decent-sized lake down the hil, albeit a bit far away to see. There was little life on it though, just a few Whooper Swans, a small flock of Tufted Ducks and a male Pochard. 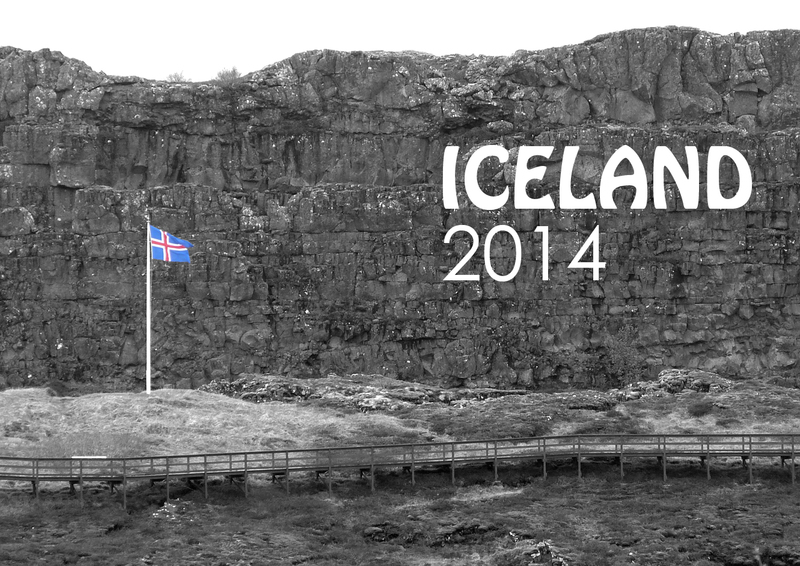 I have since learnt that the latter is quite scarce on Iceland. There had been a few seen in the country during this time. So this is where I saw the Harlequins, on the rocks below the waterfall, just where one would expect a Harlequin to be. 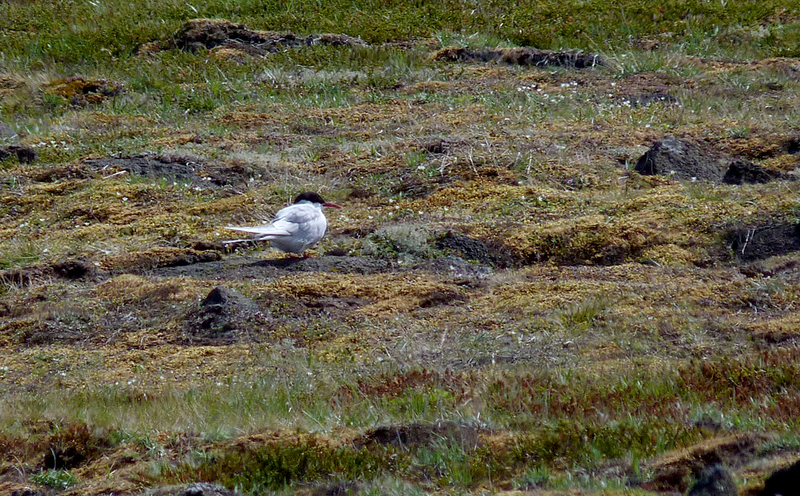 There were two male birds and a female, the males resplendent in their Icelandic flag plumage. Definitely the best duck there is and a top target. I was well pleased but the other people on the trip didn't seem to share my enthusiasm for some reason. One of the cracks in the Earth's crust at Thingsvellir. The ground round here was like the top of a baked muffin, cracked and bulging as the heat expands it. Note the Red-breasted Merganser. After this stop, we headed across to the other side of the rift valley where we were to do some caving at Gjabakkahellir. This involved a drive onto higher ground where the coach flushed another 3 Ptarmigan from the roadside and I saw my first 2 Ravens of the trip. 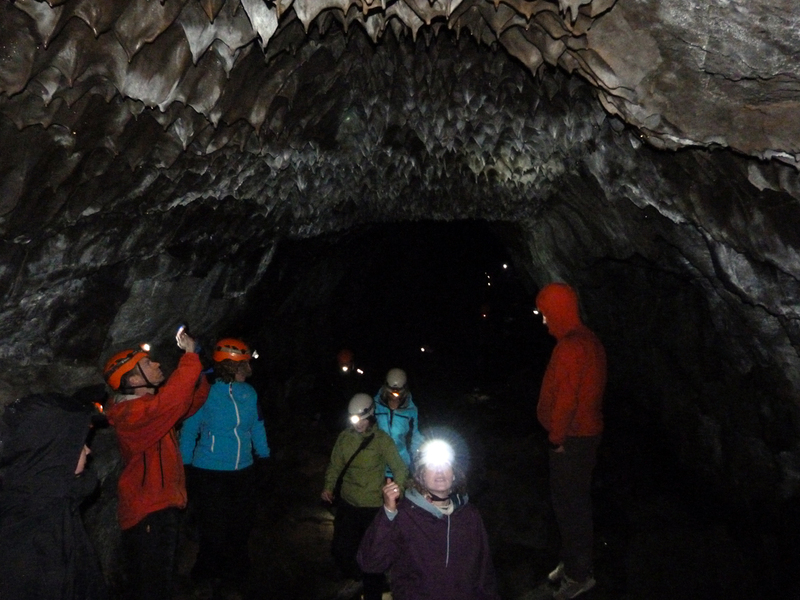 There were fewer birds up on the tops, but we spent most of the time underground in the lava tube cave. This happens where a crust forms on the top of a lava flow but the river of lava carries on underneath. 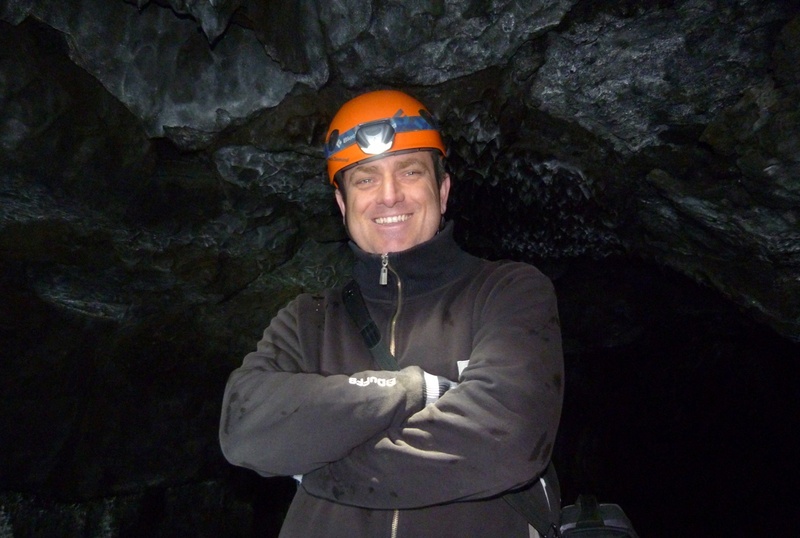 Then, this flow suddenly stops and gravity pushes the rest of the lava out of the tube (or something similar). You can see on the photo below how the rock has melted on the ceiling and was dripping from the roof (er, not whilst we were there though...). 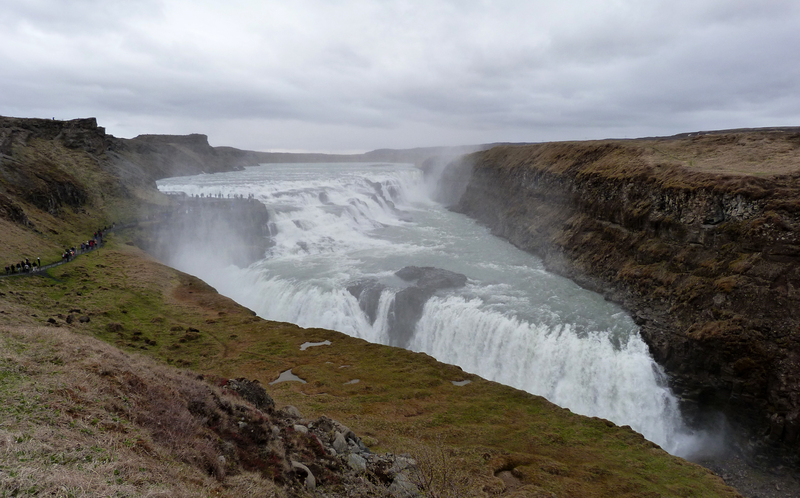 Afterwards we took in two more amazing sights, the geysers at Geysir, then the impressive waterfall at Gullfoss. At the former a couple of Icelandic Redpolls were flying around the visitor centre, but other than that there was little wildlife of interest. 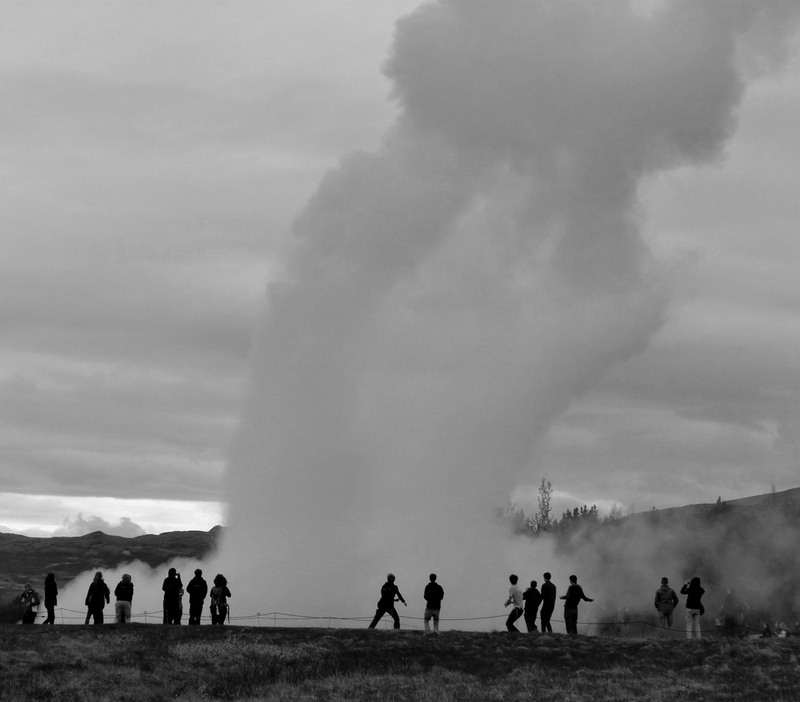 As my only previous experience of geysers was from cartoons, I was suitably impressed. I was expecting it to go off every half-hour or so, but it shot up every 10 minutes. Afterwards, we headed south and drove along the southern coastal road. In these flat fields there were lots and lots of birds. They were mostly of just a few species but, from the coach, I was seeing a lot. On occasional roadside pools there were small groups of wildfowl, including many Whooper Swans and a couple of Wigeon amongst the more common species. 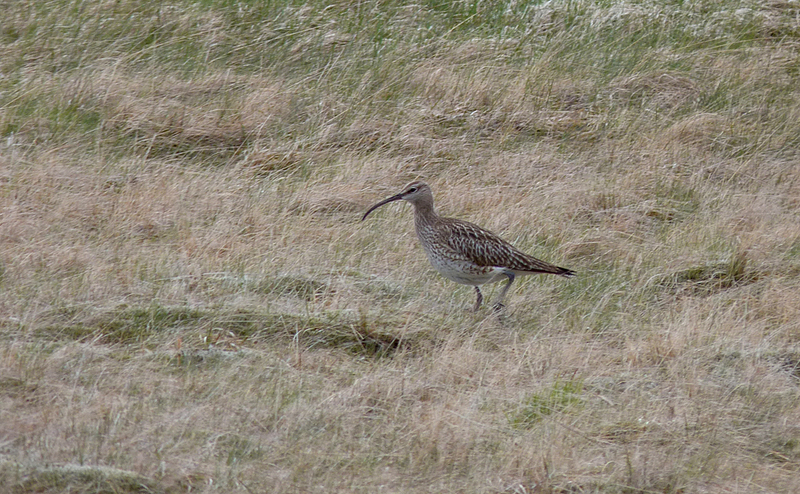 Waders were seen in profusion, including quite a lot of Icelandic Black-tailed Godwits. 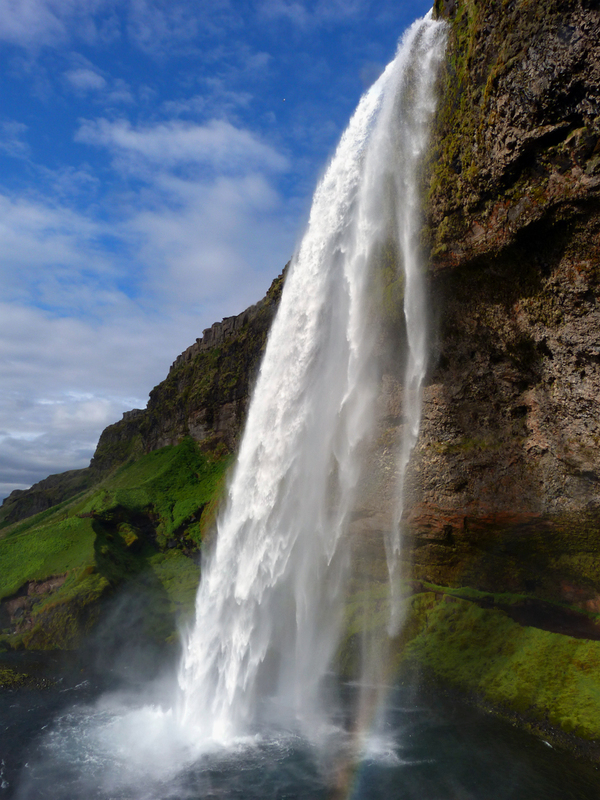 Our next stop was my favourite so far - the almost magical waterfall at Seljalandsfoss, and just as we arrived, the sun came out. This was the only sunny spell of the whole trip (apart from the last hour before the airport return). I could have taken hundreds of photos of this breathtaking waterfall that you can walk behind (see more on my Flickr album - click here: Flickr). 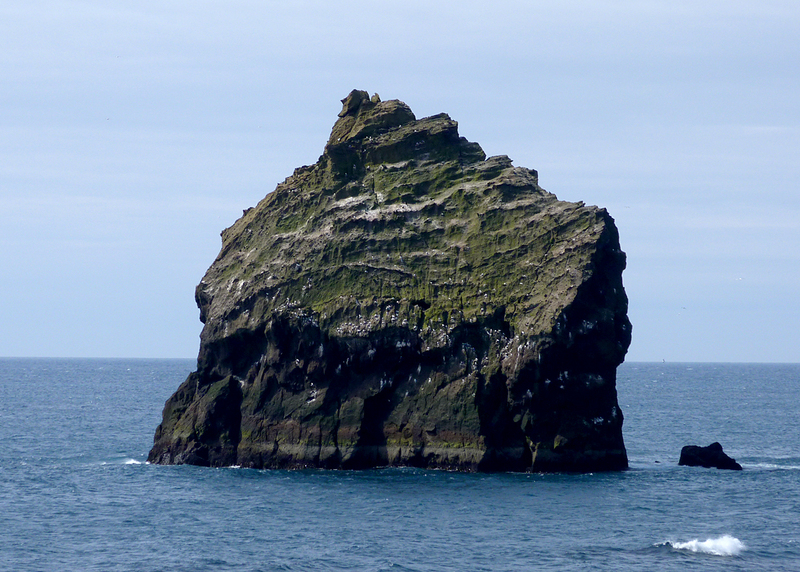 All these cliffs, which were a few miles inland, had lots of Fulmar nesting colonies on them. 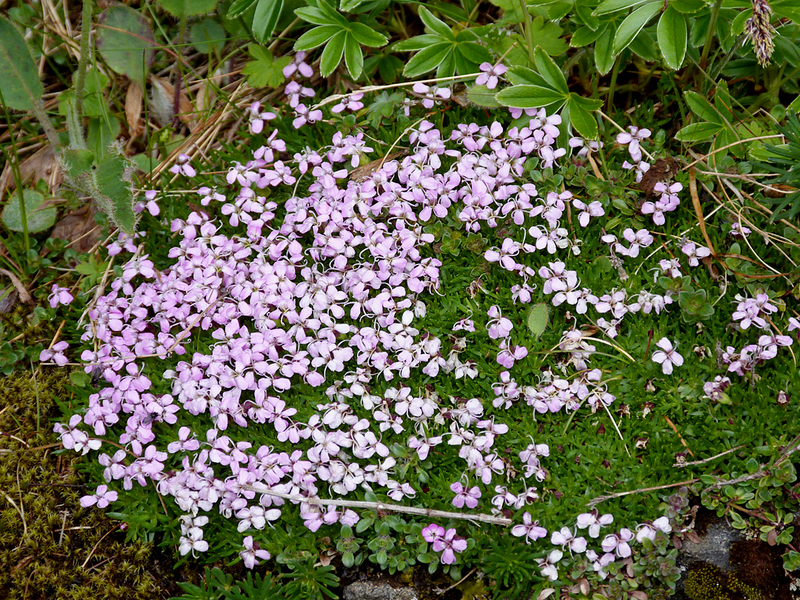 This species is so common on the south coast of Iceland, there were generally a few in the sky every time you looked up. We eventually made it to the hotel, which was more or less at the southern tip of the country, and had an evening meal. Not wanting to waste any time whilst we were here, a few of us decided to head out for a walk behind the hotel. It was almost 10 o'clock when we set off but with no darkness at this time of year we didn't need to rush back. View from the hotel window - the farm and Burfell behind that. We headed out northwards and uphill behind the hotel, passing through a farmyard. In the fields all round here there were lots of breeding waders - Oystercatchers, Snipe, Redshank, Icelandic BT Godwits and Golden Plovers. There was even a godwit feeding in the farm pond, in amongst the building. In the farmyard, we picked up a friendly dog which joined us on our walk. 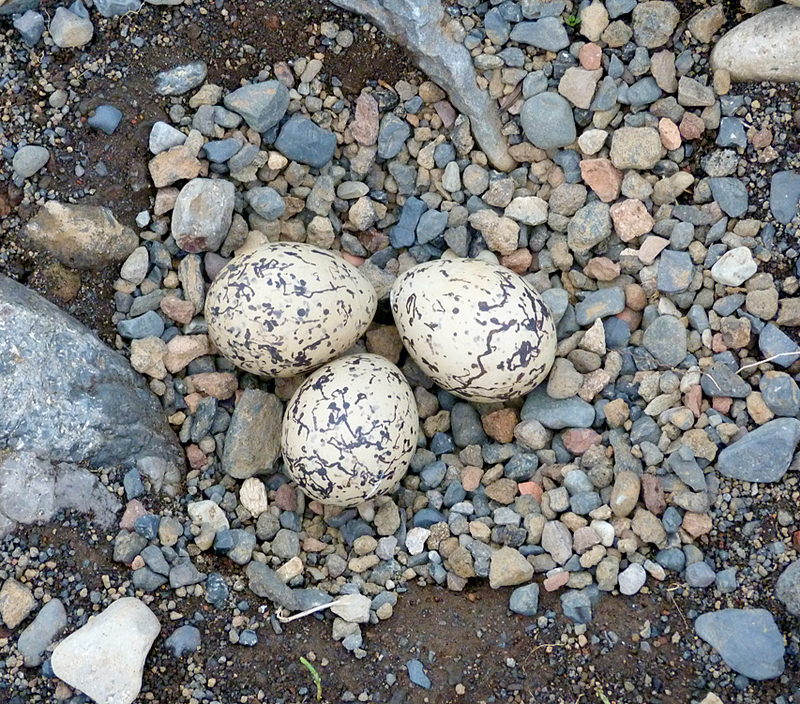 Oystercatcher nest in the middle of the farm track. As we reached the end of the fields, a decision was made to scale the peak in front of us. I was not so sure, as it looked rather steep, and my knee was still painful from twisting it a week or so ago, and it has been years since I have climbed such a hill. Nevertheless, being a man, there was no way I would look like a wimp, so I followed the others up. As we were getting closer to the top, I saw that the Fulmars were racing in from the sea towards the summit, and were clearly breeding on the cliffs. I warned the others that I was worried that we were going to get showered with vomit. After a few rests and a few hand-and-feet climbs up the steeper bits, we eventually scrambled up towards the summit, still with the dog in tow. It may seem a little far-fetched, but this farm dog seemed to be protecting us from the Fulmars. They were coming in at our level and every time one came too close, the dog jumped up towards it, barking ferociously. I think it had been trained to do this. We finally made the summit and were rewarded with superb 360 degree views. On the summit of Burfell, looking inland towards the glaciers. Looking south from the summit towards the ocean, the hotel is the white horizontal building, and one of the Fulmar nesting cliffs can be seen on the bottom right. Sitting up on the flat summit of the hill, waiting for a darkness that would never come, with hardly any wind and knocking back a few shots of "Valhalla" liqueur, was beyond peaceful. We could have been in another world completely, and I suppose we were. I woke up slightly confused and with a splendid headache, and saw that it was only 4:45. Peering outside, I was pleased that it was not raining, although it was dark and cloudy and looked like it was about to. Breakfast didn't start until seven and I was not going to just hang around in the room until then, especially as I was sharing with some other guy. So I wrapped up and headed out for a walk from the hotel. It was a bit chilly this early in the morning and there was an annoying wind but I was pleased to be out and about. I followed my nose and found a road out of town. 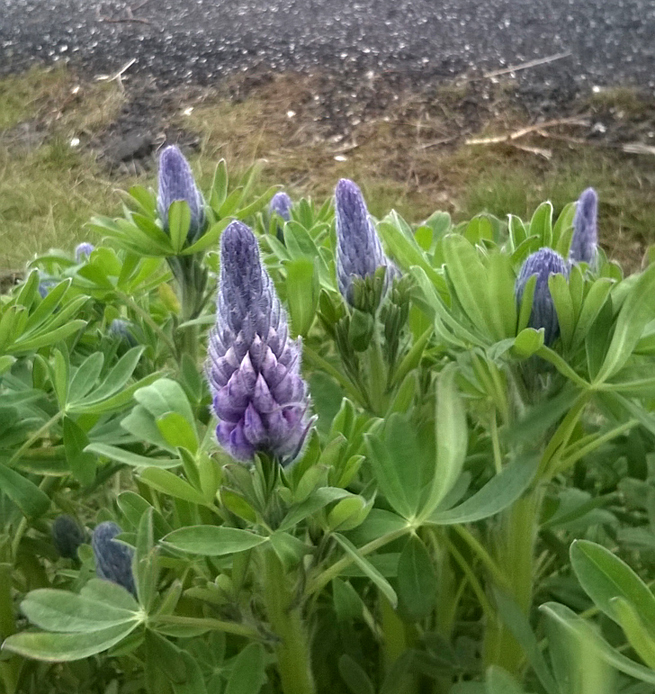 Along many of the roadsides in Iceland, Nootka Lupin grows in abundance, which is apparently introduced from Alaska to help stabilise the volcanic ash flows. Passing a small stand of birch trees I saw a couple of Icelandic Redpoll flying around the tree tops. I was interested in seeing what this sub-species looked like, but despite noting them at a few sites on the trip, they were only ever seen in flight. This may have been a good thing, as redpoll taxonomy can drive a man to madness. Striding out towards the coast it was clear that, whereas at home, the passerines are the 'everyday' birds, here in Iceland it is the waders that are everywhere. Just beyond the houses, in the rocky areas by the roadside, there were lots of Golden Plovers, Redshank, Whimbrel, Oystercatcher and Snipe. I suppose they are ubiquitous due to the lack of predators. I arrived at a bay with some decent shoreline, where there was even more waders including Turnstone, Ringed Plover and c.40 fine breeding-plumaged Knot. 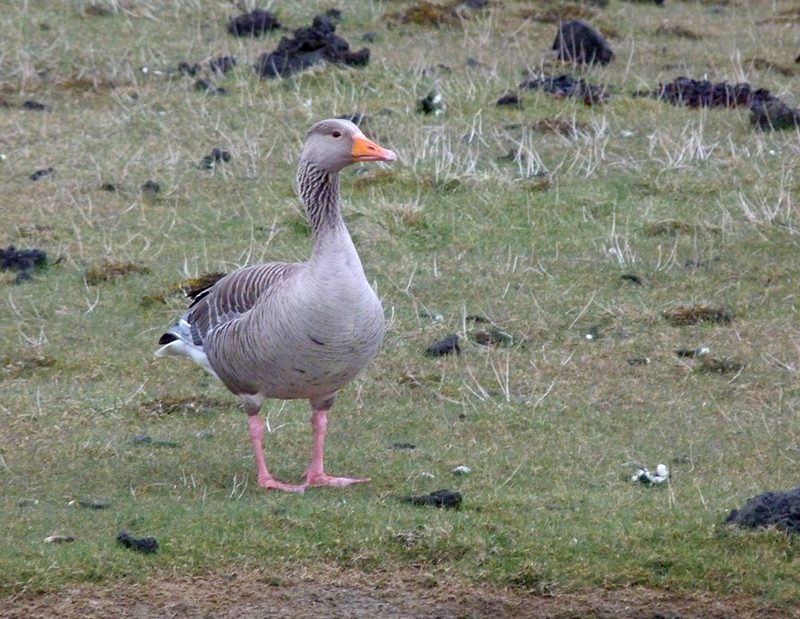 There were also numerous wildfowl, with plenty of Pale-bellied Brent Geese feeding on the short grass, along with a few Greylag Geese which appeared to be nesting amongst the rocks. 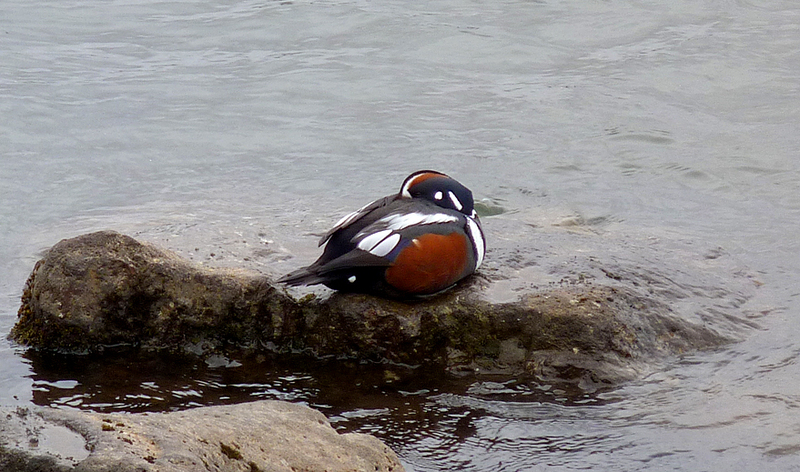 The first Whooper Swan seen was asleep by a pool and there were up to 5 Red-breasted Mergansers amongst the Eider. There was a lot of Lesser Black-backed Gulls present plus a single subadult Glaucous Gull loafing offshore. It was a superb place to spend a relaxing hour's birding so I was glad I woke up so early. 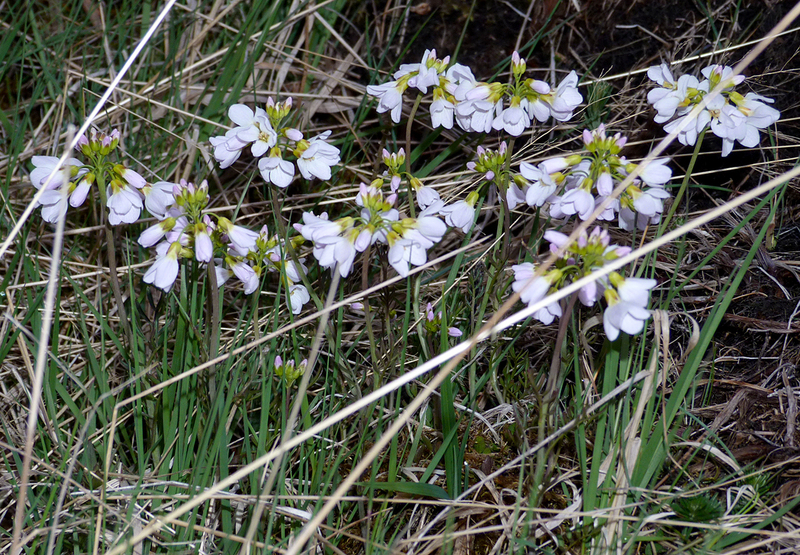 I know little of Icelandic flora, but this may be Cardamine nymanni or Lady's Smock, an arctic version of the Cuckooflower. 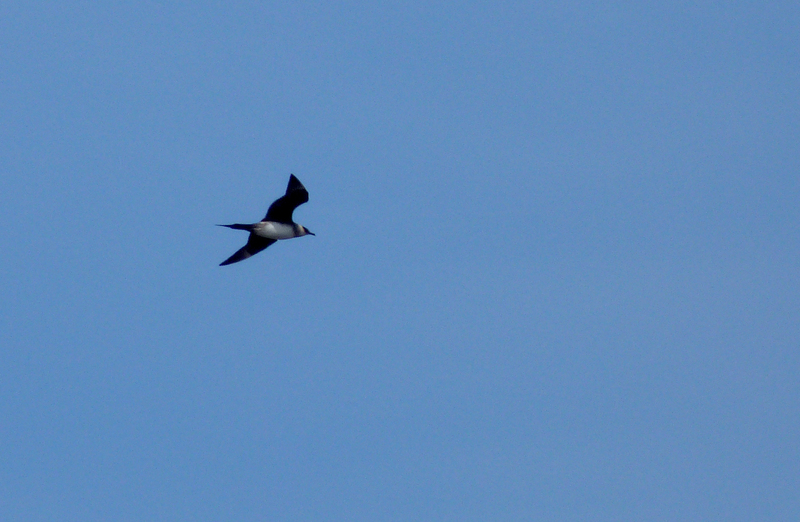 Time was getting on so I walked back along the road, overtaken by an Arctic Skua taking a short cut. There were also a few White Wagtails and Wheatears in this area. After such an early start I ate well at breakfast and was thankful that they served proper tea. We packed up and headed inland. 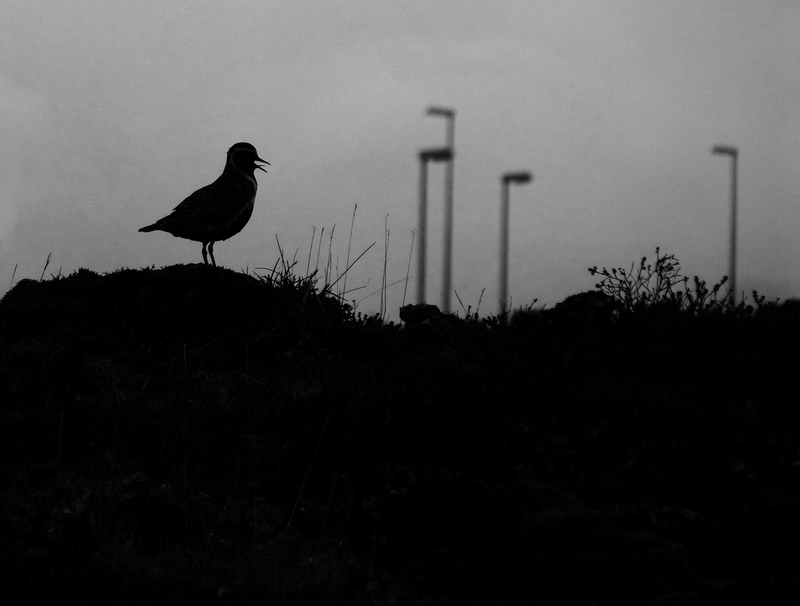 Skirting Reykjavik, I saw a few Redwings feeding on the grass verges and a group of Tufted Duck on a roadside lake. 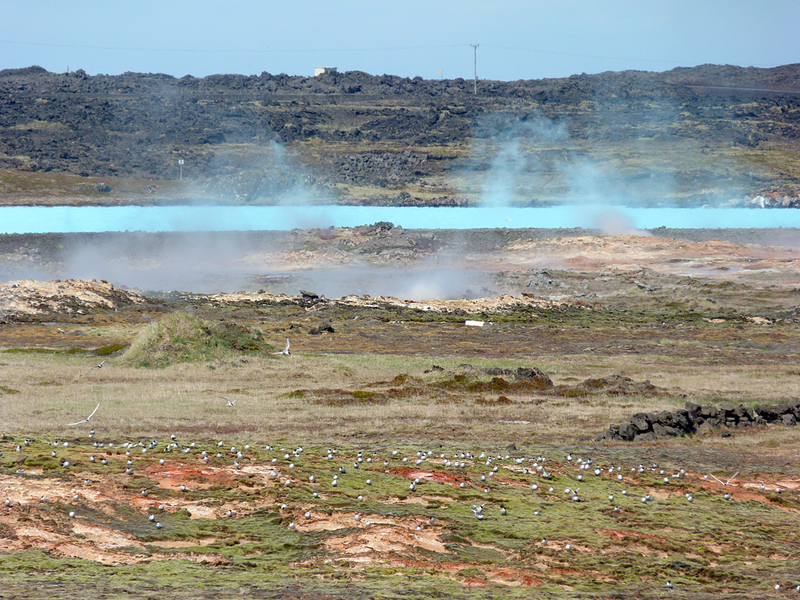 The first stop was to a Geothermal Power Station - interesting, but no wildlife - but later in the morning we crossed the first line of hils, arriving close to the shores of the massive lake, Thingvellavatn. 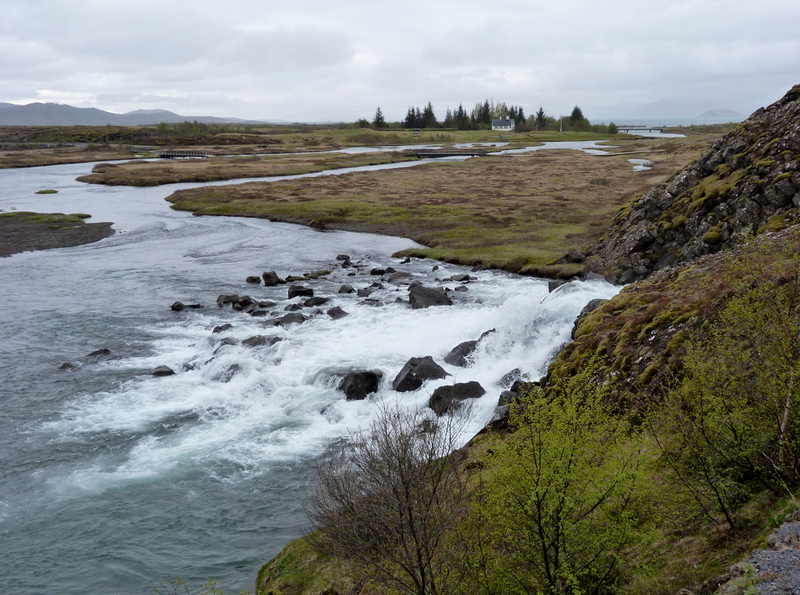 The point of interest was Thingvellir, where the country is literally splitting in two and is the site of one of the earliest parliaments on Earth. 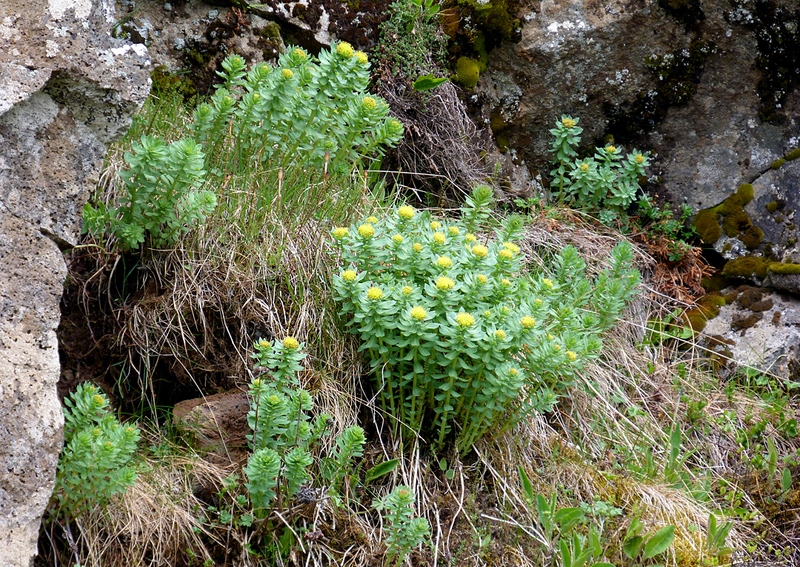 The habitat here in the interior was slightly different to the coast - lots more shrubs, small trees, heathers and dwarf willows in the cracks in the rocks - much greener. 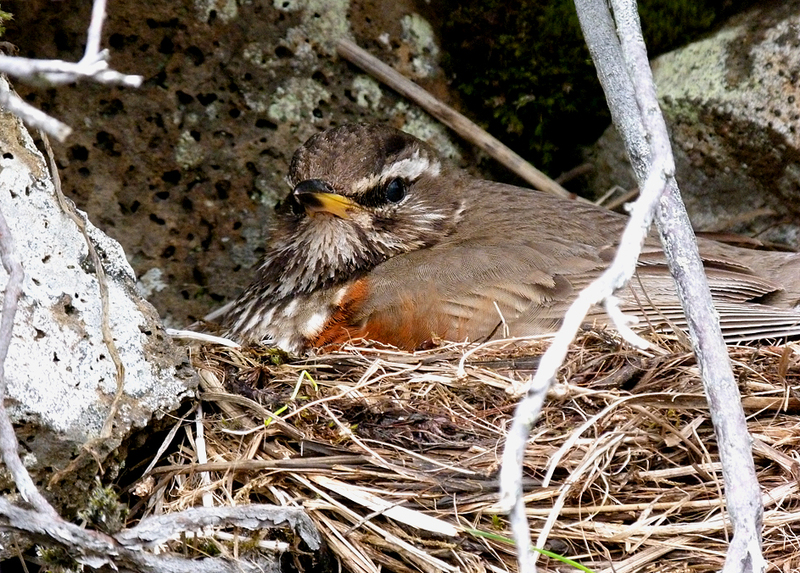 There were Redwings singing from the trees and rocks around the car park and I found a nest right next to the path. The sitting bird was totally unafraid of everyone walking past - even the non-birders of the party were impressed. 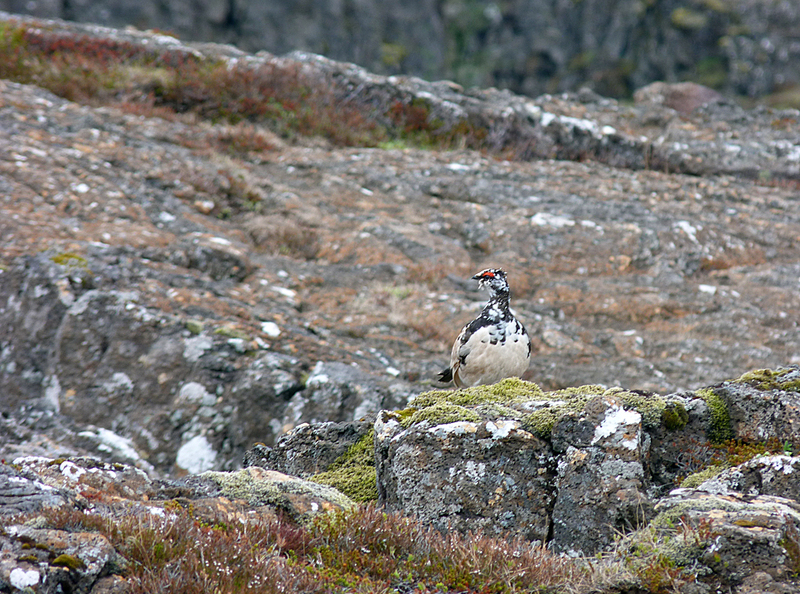 A male Ptarmigan flew in and landed on the rocks right in front of me. Frustratingly, it came close but wouldn't keep still for a second before it flew off again along the cliff edge. We walked down the main path, looking at the massive cracks in the mountain, which you could almost feel were moving apart in front of you. The tour guide was giving us some background to this, and to the history of the place, when I scanned along the river below us. There were a few Redshanks, then a couple of Red-breasted Mergansers, and then....... KA-POW!! 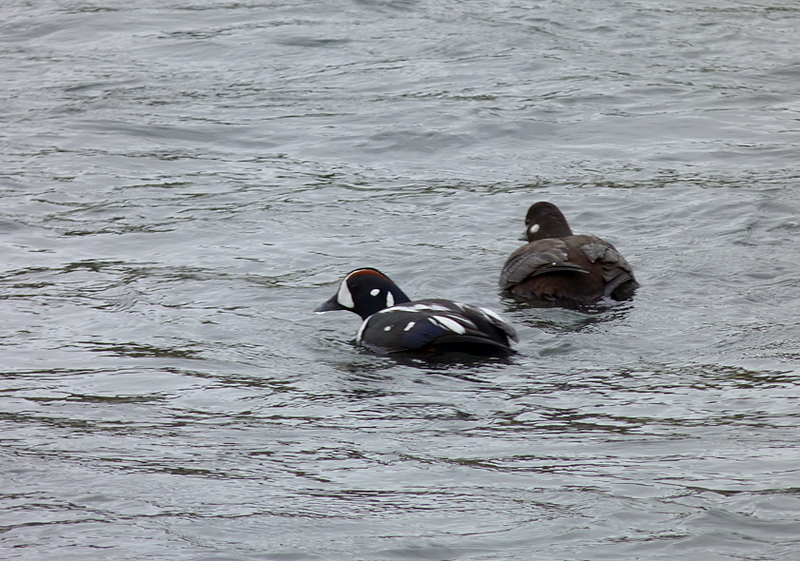 Drake Harlequin Duck - WOW! 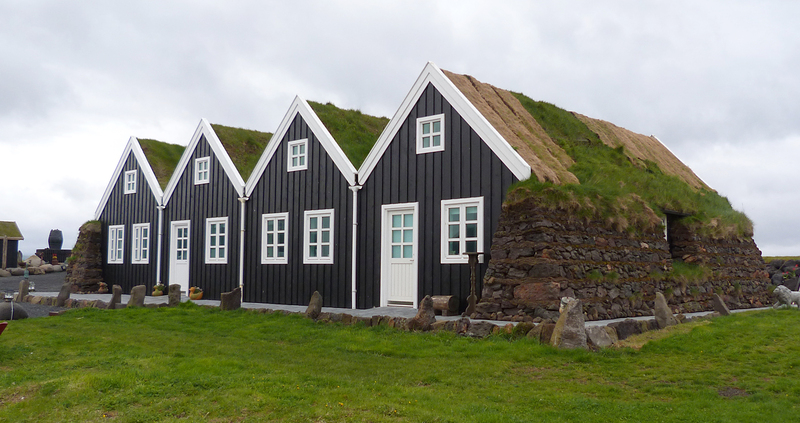 As we are taking 30 pupils on a trip to Iceland in October, the tour company involved put on a complimentary, three-day teacher's inspection trip to check-out the suitability of the locations - and I was extremely fortunate to be able to go! I was very excited about the prospect - the furthest I had travelled this century was to Aberdeen, and so was well overdue a visit to a new country. 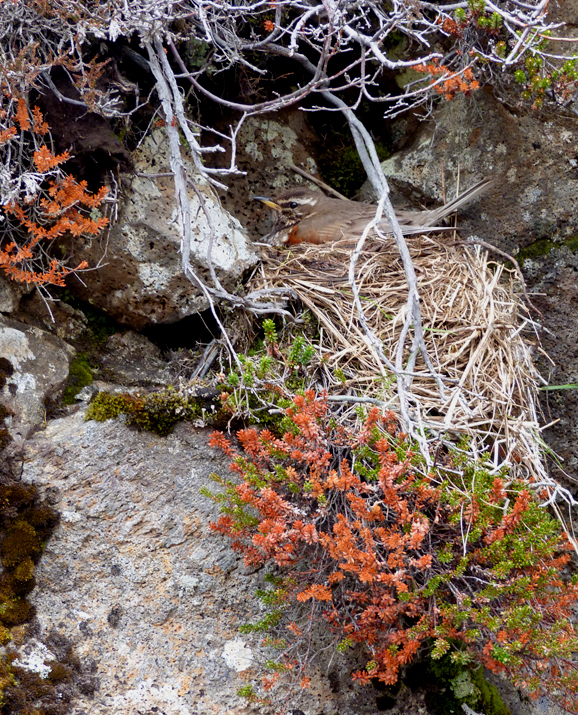 Although I did not expect to do any real birding, since this was a Geography-based trip to see plate tectonics in action, I was confident that we would be in the countryside a lot and I would see a few interesting species. The only new species possible was Gyr Falcon, but I thought this was a long shot. My other target was to see a drake Harlequin, since I had only seen a few grotty brown jobs before, many years ago in Canada. But to be honest, if you get a trip for free, you are happy enough with whatever you see. The flight to Iceland was from Heathrow, which meant that I needed to set off the afternoon before, otherwise I would have not made it from Gatwick in time. So, a coach journey later, plus another short airport-bus trip, brought me to my hotel for the night near Heathrow. Walking out to buy a snack it tickled me to watch a few Ring-necked Parakeets flying around these suburbs. The next morning I had a hearty breakfast in the terminal and waited for check-in. I was planning to spend zero money in Iceland since meals were included, and so I decided not to buy any Icelandic Krona. It was a bit of a gamble, but I had packed a packet of Mars Bars in case of hunger emergencies. I met up with the tour leader and the teachers from other schools, and we were soon winging our way North. Arriving at Keflavik Airport I soon saw what the weather forecast had indeed forecasted - miserable rain. It was a really bleak sight from the coach, staring out over drizzle-soaked lava fields. 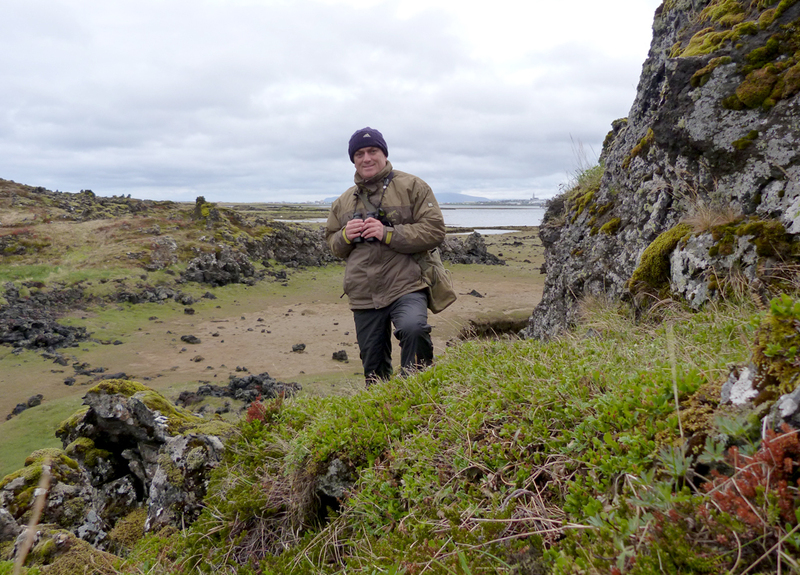 This corner of Iceland was very new, and there was little soil or plants visible, just moss-covered, jagged boulders. 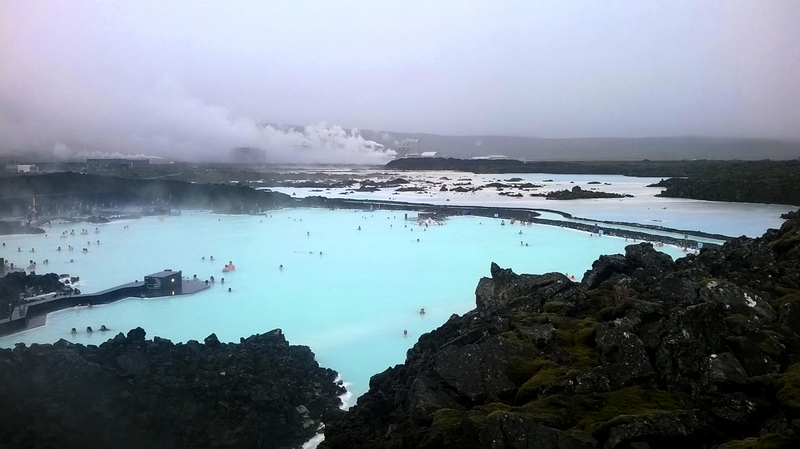 It wasn't long before we pulled into the "Blue Lagoon" car park. This was an open-air geothermal pool that they had made into a swimming baths-type place. So, with my bathers packed into my hand luggage, I reluctantly went inside (swimming and all it entails generally displeases me). Stepping outside into the cold rain in my trunks was the opposite of pleasant and I made a dash for the water and....ahhhhhhh. The most pleasurable swimming experience I can remember. Without the distressing coldness of the sea, but also without the bleach, verrucas and elastoplasts of Kippax Baths. I thoroughly recommend it, although it tastes very very bad! Whilst swimming around I noticed a small bird flitting around the rocks, and through the steam, I could just make out the white wing flashes of a Snow Bunting. Back outside the entrance, I could hear it singing through the now persistent rain - the first bird of the trip! I thought this species may be common here but this was the only one I would see. Afterwards we headed to the hotel in the town of Hafnarfjordur, on the southern outskirts of Reykjavik, where we dropped off our bags and took a drive out to a fishing village on a peninsula at Hlid. At last, with the rain slowing down and driving close to the coastline I finally saw some birds from the coach window. 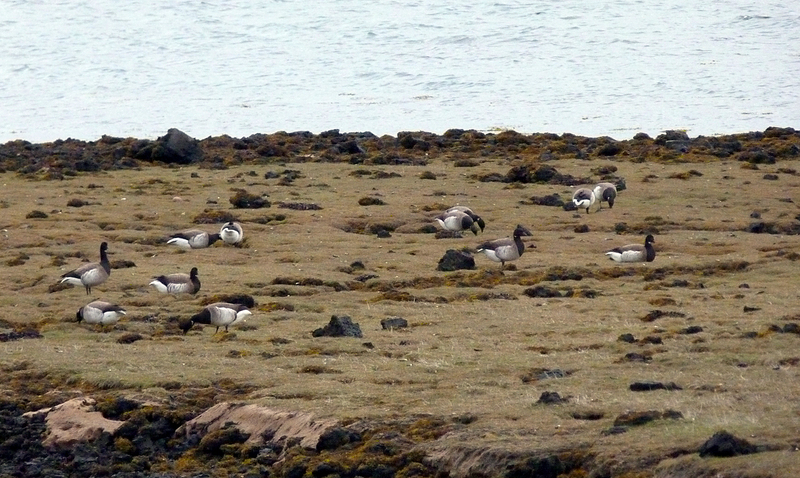 There were lots of flocks of Pale-bellied Brent Geese in all the fields around here, staging on their way to their breeding grounds further north still. The shoreline was dotted with Eider and the odd flock of bright red Knot. Arctic Terns bounced around all over the place and two different Glaucous Gulls flew by offshore. The only passerines were a few Wheatear and Starlings. I was desperate to spend more time looking but, as would be the case at most of the stops, we were quickly ushered back to the coach. We had a meal at the Viking restaurant at the Viking hotel in the Viking village, where we were entertained by a singing Viking (although I'm pretty sure he wasn't a genuine Viking). I crashed out at the hotel an hour or so later (perculiarly narrow beds for such a broad-shouldered nation). I was disappointed by the weather so far and hoped for better luck tomorrow when we were to head inland.